Ross's Law Marketing Blog: How to PROVE your website conveys the right message. Interesting RESULTS. How to PROVE your website conveys the right message. Interesting RESULTS. [Here’s the third installment in the Vedder Price London Launch series. After the web-based market-research participants have had their eyeballs tracked all over the ads, websites or other marketing materials, we asked a series of questions regarding their perceptions of the two home page designs. Was their reaction to the websites positive or negative? (Both sites scored overwhelmingly positive). What was the general impression of the quality of the technical skills of the law firms represented by the websites? Again, extremely positive, although the more conservative “Icons” version tested slightly better, with an impressive 85% perceiving “Very good” or “Excellent” technical skills. Not bad results after a quick look at a website home page. What we thought was particularly instructive was the viewer’s emotional connection. We asked which among a list of adjectives viewers felt described the firms represented by each of the websites. The results were quite helpful. 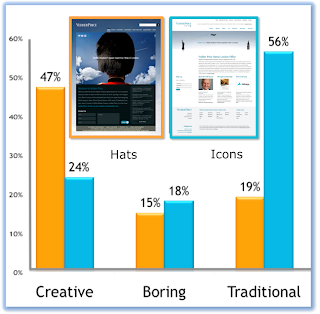 Although the sites were very different in design, tone, imagery, layout, and appearance, neither was considered “Boring” (just 15-18%). In other words, a firm's marketing can be professional, ethical, and conservative, while still being unique, eye-catching, and effective. Nearly twice as many called the “Hats” website “Creative” than the “Icons” site. In other words, not only did the Eye Track testing objectively shows that the Icons campaign conveyed our message more effectively, but the viewers’ subjective perceptions supported the choice as well. All in all, a nice result. If your firm, big or small, would like a new image, marketing campaign, or website, please give Ross Fishman, CEO of Fishman Marketing a call directly, at +1.847.432.3546. All images (c) 2011 Vedder Price LLP, Fishman Marketing, Inc., or Eye Track Shop, Inc.